Playing Cards (classic) - Britannia Airways pack of playing cards showing 737 unopened in mint condition. Britannia Airways pack of playing cards showing 737 unopened in mint condition. 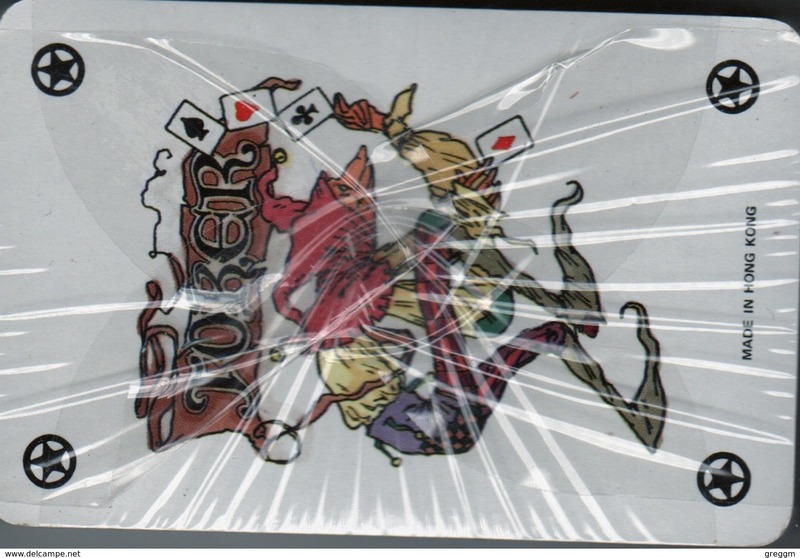 This pack is still in its cellophane and is a complete pack with 52 cards plus two jokers. This pack has never been opened and the joker showing has a black star in each corner. 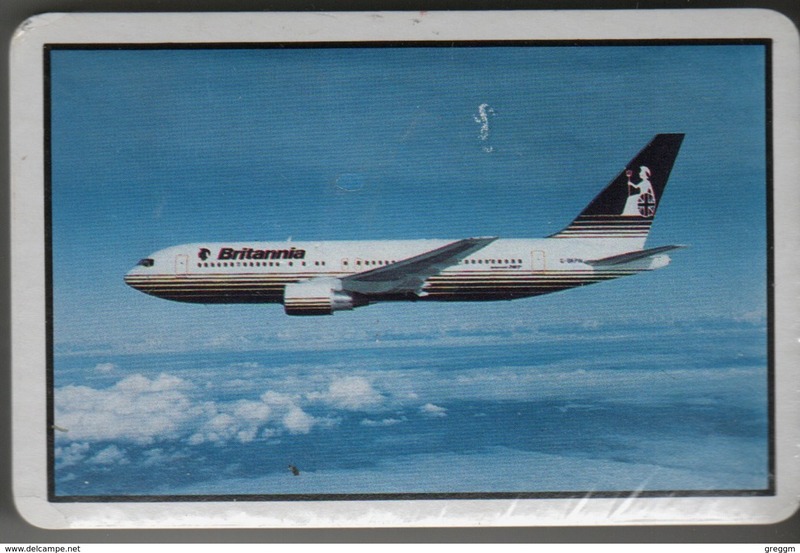 Britannia Airways ceased trading in 2005 so I know these cards pre-date that but not sure by how much. For larger packages or packages with a value over £20 I will send these 'Signed For' to ensure the item reaches its destination, the cost of this will be £1.75. Postage and Handling £2.75 can combine several lots. Once the weight for this postage cost has been reached then the postage will be governed by weight. For Europe then packages up to 250 grams will be £3.90 and over 250 grams the cost goes up to £5.15. These rates can be found on the Royal Mail overseas postage rates. The rates outside Europe are slightly higher. With packs up to 100g the cost will be £3.30, up to 250g it will be £5.15 and up to 500g it will be £7.45. Thank you for considering this item of mine. Should you be successful in your bidding the item should arrive promptly once paid for, however if for any reason it does not then please contact me to let me know to give me time to check or if need be refund your money. Important Notice regarding postage - Our UK postage costs are based on you winning one small item that can be sent as a small letter first class. If you win more than one we are happy to combine them into one packet to keep the postage costs down. If you are bidding on a larger item such as a cover it might have to be sent at the large letter rate in which case the postage costs will be slightly higher but we will do our best to keep it to a minimum. If you are bidding on many items please just let us know when you are finished and treat the invoices as information only. We will require those people bidding on multiple lots to settle their accounts within 21 Days unless you have prior agreement. Once we have reached 21 days without payment an unpaid item case will be opened automatically. Please Note - Whilst we fully understand the desire to combine lots to save on postage we are also acutely aware that on occasion items can go missing in the post. For this reason we reserve the right to say that items that exceed £25.00 or lots where more than ten individual auction lots are included then that package will be sent 'signed for' at a cost of £2.75 within the UK. We will not allow a buyer to accumulate more than 25 lots, this is our limit. All additional lots will then show on a separate invoice and therefore will start the postage process again. This ensures that you receive your items and therefore are not disappointed and we as the seller are not obliged to give a refund when the item has been lost in the post. For overseas customers our standard cost is £2.75 but often we can get several lots in one packet for this. If it is possible to reduce this on the invoice we will do so. I start almost all my lots between 39p and £1.25 meaning it is not possible to offer free postage and packing as in some cases they will sell at the starting price, we will however attempt to keep our postage costs down as much as possible. If you are bidding on many items please just let us know when you are finished and treat the invoices as information only. Because of the magic 30 day period that operates with regards to invoices and feedback we will require those people bidding on multiple lots to settle their accounts within 21 Days unless you have prior agreement. Once we have reached 21 days without payment an unpaid item case will be opened automatically. My name is Gregg and I have been involved in stamps for over 50 years. I hope you will find my items of interest. Should you have any questions I am always happy to answer where possible. To save on postage I am always happy to combine lots, you only have to ask. Most recent additions to my shop include Late british fine used single commemoratives and mint late German 1990-1999. Pack of playing cards showing green design unopened in mint condition. Cyprus pack of playing cards showing Island view unopened in mint condition. Britannia Airways pack of playing cards showing 737 unopened in mint condition. London pack of playing cards showing London Bridge view unopened in mint condition. Ireland pack of playing cards showing different views unopened in mint condition. London pack of playing cards showing Westminster view unopened in mint condition. Wales pack of playing cards showing Welsh views unopened in mint condition. Devon pack of playing cards showing County view unopened in mint condition.